Over the next couple of years, as I emerged from a life stalled by gluten-induced anxiety and poor health, I began to realize that socializing was the very best way to experience everything. As I learned to be at ease with myself, the bright orange cover of this book began to call out to me on the shelf. Still, I ignored it. For those who are not ‘in the choir,’ it will be an eye-opener. It is full of ideas on how to be (more) interesting, how to make contact, how to stay connected, how to build something worthwhile with others and so on. 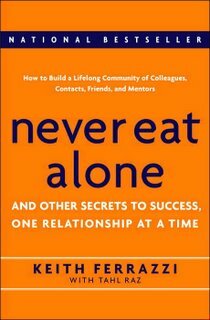 It has great real-world examples of the power of relationships, humbling moments and how often the most valuable of connections happen by accident. Toward the end of the book, as he addresses reader’s possible objections and doubts, Ferrazzi challenges the mainstream myth of “balance.” I nearly threw down the book and cheered! What is balance but keeping your life segmented into bits and bobs? It’s perfection masquerading as an achievable goal. It’s utter madness. At the constant peril of burnout, I choose to fill almost every moment of my day with others (and a little bit of downtime to process it all). Whether it be work, chores or a long hike… it’s all better with loved ones. At work the next day after finishing the book, I let the edges between work and play blur and began – once again – to reach out. I’ve got my fingers crossed that colleagues and old friends remember me fondly and are interested in… oh I don’t know… going out to eat sometime? We just talked about this book at my book club meeting, but it was more in passing (not an in depth analysis). Several people said they liked it. Based on your summary, this correlates with “The Art of Happiness” and the importance of connections with others. I look forward to reading it.